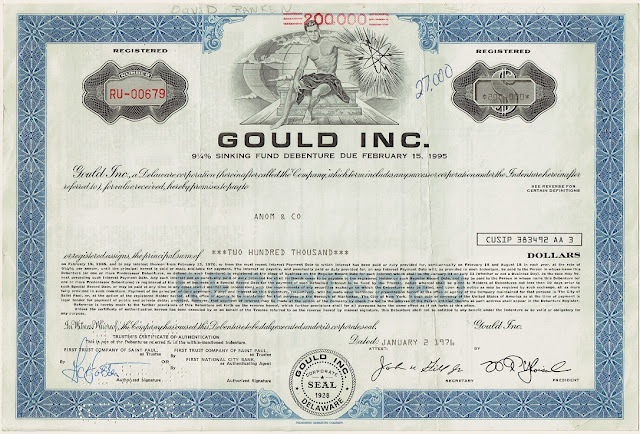 Internet Scripophily Museum of Computing: Gould Inc. The National Battery Company (NBC), incorporated in 1928, acquires control of the Gould Storage Battery Company in 1930. After that, the latter operates as a subsidiary under the name Gould Storage Battery Corporation. NBC purchases the storage battery division of the Philco Corporation in 1947. Three jaars later, NBC changes its name into Gould-National Batteries, Inc. (GNB). In 1969, GNB merges with the Clevite Corporation, a manufacturer of precision automotive parts, marine electronics and batteries. 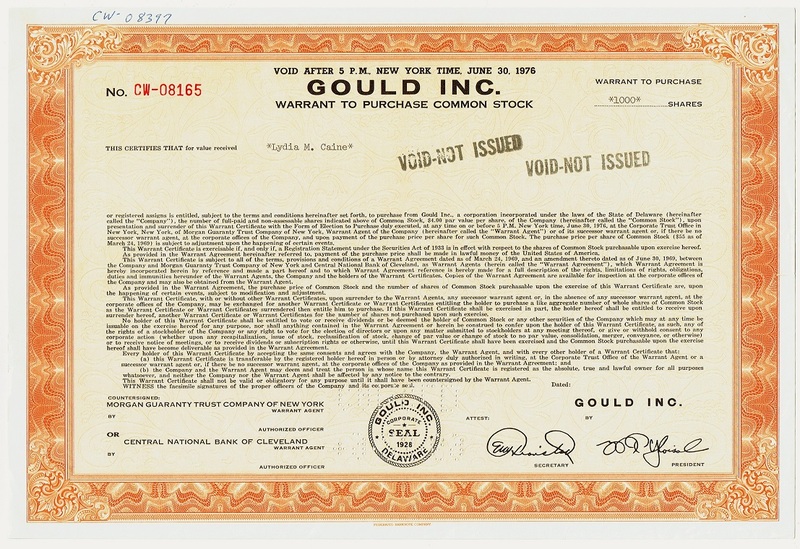 The new entity results in Gould, Inc., and engages more in digital electronics and computer peripherals. After the acquisition of Systems Engineering Laboratories, a manufacturer of minicomputers, Gould becomes a supplier of mini- and superminicomputers including CAD/CAM turnkey computer systems. Gould's securities were designed with an allegorical figure controlling a trio of interacting electrons. 1971 Gould wins a $1.5 billion U.S. Navy procurement contract for the computerized Mark 48 torpedo. 1973 Introduces the Gould 700 line of computer-output microfilm (COM) recorders. In 1975 compatible Gould Beta COM systems include a disk file, a stroke character generator, modular software, and an operator console. 1974 The Gould Plotmaster System, an off- and online electrostatic printer/plotter system, is introduced. 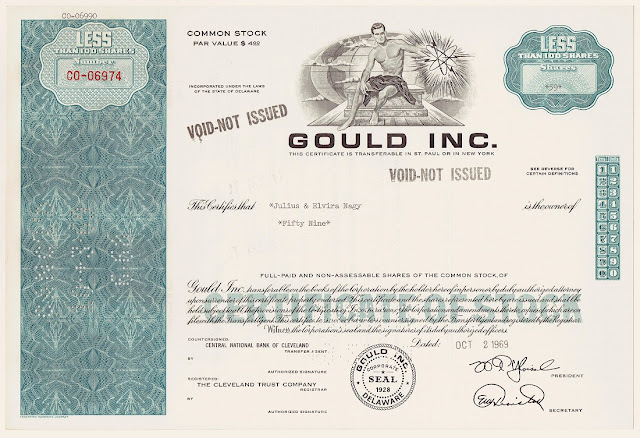 1975 3M Company acquires Gould's Graphic Systems Division which produced the computer-output microfilm (COM) recorders. 1975 The company announces the Gould 6000 analog to digital data logger-reader and one year later the Gould 6100 data logger-reader. These systems collects, digitizes and stores low-frequency data on magnetic tape for subsequent processing e.g. by one of Gould's printer/plotter systems. 1977 Gould introduces a remote graphics processor (RGP) that gives remote terminals the capability of generating hard copy when coupled with a Gould 5000 Series electrostatic printer/plotter. 1979 Gould does not succeed in acquiring the Fairchild Camera and Instrument Corporation and the Mostek Corporation. As a result Fairchild was acquired by Schlumberger Ltd and Mostek by the United Technologies Corporation. The loan was authorized on Feb 15 1970 and limited to $25,000,000. 1981 Gould acquires Systems Engineering Laboratories which continues to operate as the Gould Computer Systems Division. 1981 Gould acquires American Microsystems, Inc., a maker of custom semiconductors. 1983 A pair of Gould SEL 32/8780 digital minicomputers are used in SAIL (Shuttle Avionics Integration Laboratory simulator environment). Other SEL computers are used for digital autopilot simulation, solving equations of motion, radar altimeter, and other nonavionics functions. 1984 Gould introduces the CONCEPT/32 family of real-time 32-bit minicomputers. The systems run on Gould's Process Automation and Control Executive, PACE/32, a menu-driven software system which allows engineers to implement process automation strategies without programming. 1984 The 32-bit PowerNode 6000 runs on Gould's UTX/32 (Universal Time-sharing Executive) operating system, a compatible multiprocessor extension of the Unix operating system consisting of AT&T System V and Berkeley BSD environments. The system comes with the Gould Selbus, which offers a data transfer rate of 26.7 Mb/sec. 1984 Gould enters the CAD/CAM marketplace as a turnkey supplier with the introduction of the PowerStation 3100 and 5100. These two standalone workstations for mechanical CAD/CAM applications are UNIX-based and use a software package from Vulcan Software under a software license agreement. 1985 One of Gould's primary contributions to the real-time computing world was its "Reflective Memory" technology which allowed up to eight computers to share distributed memory at a high speed. 1986 Introduces the PowerNode 9000 32-bit computer systems. An optional 32-bit Internal Processing Unit, a duplicate of the CPU, can be added to the system to improve computational throughput. Up to 16MB of main memory can be optimized with up to 64KB of cache memory per processor. 1987 Introduces the NPL family of mini-supercomputers for computationally intensive engineering applications. The NP1, the first series of the new family, has an open systems architecture, including parallel and high-speed vector processing, and massive memory. The NP1 models range in price from $395,000 to $2.9 million. The largest system, the Model 480, has up to four billion bytes of physical memory. 1989 Sells its computer division to Encore Computer Corporation and its Modicon division to AEG.